The book covers basics of noncommutative geometry and its applications in topology, algebraic geometry and number theory. Intended for the graduate students and faculty with interests in noncommutative geometry; they can be read by non-experts. The first seven lectures deal with the homological part of the story (cyclic homology, its various definitions, various additional structures it possesses). Then there are four lectures centered around Hochschild cohomology and the formality theorem. These lectures are intended to introduce key topics in noncommutative geometry to mathematicians unfamiliar with the subject. Topics: applications of noncommutative geometry to problems in ordinary geometry and topology, residue index theorem, etc. These lectures notes are an introduction for physicists to several ideas and applications of noncommutative geometry. The necessary mathematical tools are presented in a way which we feel should be accessible to physicists. This is an extended version of a three hours lecture given at the 6th Peyresq meeting 'Integrable systems and quantum field theory'. 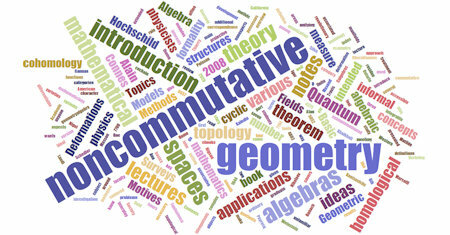 We make an overview of some of the mathematical results which motivated the development of noncommutative geometry. Noncommutative geometry is the study of noncommutative algebras as if they were algebras of functions on spaces, like the commutative algebras associated to affine algebraic varieties, differentiable manifolds, topological spaces, and measure spaces.